Would losing Albert Pujols really be a terrible thing? Six playoff berths, five division titles, two NL pennants, one World Series. Rookie of the Year, nine All-Star games, six Silver Sluggers, two Gold Gloves, 10 top-10 MVP finishes, three MVPs. Albert Pujols’ first decade in baseball was one of the most celebrated, and decorated, in the game’s history. A month from now it could all be over, leaving the St. Louis Cardinals with one of the toughest decisions any team has faced in years — and the potential to dramatically transform their franchise. For the first time in his career, Pujols looks likely to post a wOBA below .400. At .390, he still isn’t far from the league’s elite, ranking 23rd in MLB, behind the likes of Alexes Gordon and Avila. Pujols is walking in just 9.9 percent of his plate appearances, by far his lowest rate ever. After leading the league in intentional walks in each of the past three seasons with 34, 44, and 38, Pujols has drawn just 12 this season. Part of that would seem to be a function of Matt Holliday having a huge year hitting behind him, but Holliday had a big 2010 batting cleanup, too. He’s also swinging at more pitches out of the strike zone. Indeed, his O-Swing percentage has nearly doubled in the past seven years: Pujols swung at 15.7 percent of pitches out of the zone in 2004, versus 29.7 percent today.1 But here again, there might be mitigating circumstances. League averages have also climbed sharply in the past few years, likely due to a combination of shoddy umpiring and improved pitching, but also an inconsistent standard for what constitutes an out-of-zone swing. Of course, it’s not all as bad as it looks. Take Pujols’ batting average, which is on pace to end up under .300 for the first time in his career: His BA on balls in play sits at .264, 47 points below his career mark. He’s still hitting line drives (the balls most likely to fall in for hits) as often this year as he did last year — and he’s hitting more ground balls than ever before, and grounders actually go for more hits than fly balls. So it seems like bad luck more than a reduced ability to hit the ball hard is in play here. He’s on pace to post the second-smallest games played total of his career. But that’s due to a freak wrist injury suffered in a collision at first base. Even then, Pujols was back in 2½ weeks, after doctors initially estimated a four- to six-week absence. He’s even defied the near-universal belief that wrist injuries sap power. Since coming off the disabled list July 6, Pujols has swatted 17 homers. So it would appear that Pujols’ skill set remains intact, with the dip in his numbers largely explained by the freak injury, better pitching, and bad luck.2 If he’s (nearly) the same dominant player he’s always been, and the face of the Cardinals franchise, clearly they should re-sign him, right? As mentioned when we recently covered the Cubs’ potential interest in Pujols, many people believe he’s older than his listed age of 31. Whether that’s a function of his Dominican birth certificate, his size when he played high school baseball in Missouri, or the nearly unprecedented success he had from the time he was a 21-year-old rookie, doubts abound. And given that Pujols might be on the verge of getting contract offers for seven, eight, or even 10 years — and given what we know about baseball players and aging curves — if Pujols turns 33 or 34 in January (and not 32), that could cost a team millions of dollars in value. Maybe tens of millions. So what might it cost the Cardinals, or anyone else, to sign him? Mark Teixeira offers one possible comp. After the 2008 season, the Yankees gave him an eight-year, $180 million contract. Teixeira was three years younger then than Pujols is now. On the other hand, Mark Teixeira is no Albert Pujols. Not even close. At the high end, there’s Alex Rodriguez. Four years ago, the Yankees handed him the richest contract in the sport’s history, 10 years and $275 million. On one hand, A-Rod was a year and a half older than Pujols when he signed. On the other, Rodriguez is one of the very few players in baseball history who can claim a more impressive career than Pujols, while also having delivered slightly more value to his teams by the age of 31. And here’s the thing: A-Rod’s contract doesn’t look too hot right now. He missed an average of 29 games a season in the first three years of the deal. This season he’s played in just 84 games. The past two seasons have been the worst two of his career. He has six years and $153 million left on his deal. So what should Pujols expect to make in free agency? That question depends on your perspective. We can ask what the market will bear, what it ought to bear, or what Pujols can reasonably expect the market to offer. but maybe the Cubs? The Mets and Dodgers if they get their financial houses in order? Other mystery teams?) and, as previously mentioned, how old Pujols actually is. That’s not all. Over the next few years, he could reach several major milestones, including 500, 600, maybe even 700 homers. He’s got a shot at 2,000 runs scored and 2,000 RBIs, too. You can debate the meaning of round numbers all day — but they sure as hell are marketable. The Cardinals already rank among the league leaders in attendance, drawing nearly 38,000 fans a game this year (6th in MLB) after bringing in nearly 41,000 a game last year (4th), more than 41,000 in 2009 (4th), more than 42,000 in 2008 (4th), nearly 44,000 in 2007 (4th), and so on. While it’s tough to quantify the drawing power of any one player, there’s no question that Pujols helps bring the boys (and girls) to the yard, both by helping his team win more and through the sheer force of his stardom. Though the Cardinals have drawn close to capacity crowds in the past few years, they could completely pack the place as Pujols approaches key milestones. They could also make money through sponsorships, media deals, and other avenues. There are strong incentives, both visceral and financial, to re-sign him. There’s also some major opportunity cost here. Despite a rabid fan base that packs the stadium and solid revenue sources elsewhere, the Cardinals are most definitely not the Yankees. In its 2011 reckoning of every team’s financials, Forbes ranked the Cardinals just 11th in MLB in franchise value, with revenue of $207 million also ranking 11th. This season marked the first time the Cards ever reached triple digits for major league payroll. Add all the tangibles and intangibles that go beyond Pujols’ expected production, and something like a 10-year, $300 million contract can’t be ruled out. The Cardinals have always been a top-heavy club, relying on Pujols, a few lesser stars, and a lot of cheap role players. But there’s a strong argument to be made for not spending 25 percent to 30 percent of your payroll on one player. You can only rely on the Jon Jays and Daniel Descalsos of the world for so long. All of which raises the question: What if the Cardinals let Albert Pujols go? Nearly every major Cardinals contributor this season is also under contract for 2012. The entire rotation is set, with Chris Carpenter, Jaime Garcia, Kyle Lohse, and Jake Westbrook all locked up and the Cardinals “unofficially” agreeing to pick up a two-year, $21 million team option on Adam Wainwright. Carpenter’s fading, Lohse can’t be counted on forever to get batters out with a microscopic strikeout rate, Westbrook is just a decent inning-eater at this point, and Wainwright might be the biggest question mark of all, the team’s de facto ace who’ll be trusted to make a complete recovery from Tommy John surgery just more than a year after going under the knife. Holliday’s theirs for at least five more years. Younger players like Jay, Yadier Molina, and David Freese aren’t going anywhere. Lance Berkman has expressed interest in coming back, though the Cardinals will likely owe a substantial raise to Berkman after the one-year, $8 million deal that brought one of the deadliest bats in the game this year (.403 wOBA). If the Cardinals chose to hold back and not sign Pujols or any other major free agents this offseason, they could still be a competitive team. In Reyes, the Cardinals would be taking a chance on a player who’s missed significant time with injuries for three years running. But they’d also fill a gaping lineup hole, replace a good chunk of Pujols’ star power, and give the team a skill set that it has lacked for a while. With the money they’d presumably save, the Cardinals could get more aggressive in the draft, seeking out the kind of high-upside picks they’ve shunned for years. They’ve gotten better at it more recently, targeting the likes of phenom Shelby Miller rather than settling for high-floor, low-ceiling types like Lance Lynn. They could also fill Pujols’ vacated lineup spot, and maybe plug some other holes, too. That includes the one they created when La Russa found his latest whipping boy in Colby Rasmus4 and had him shipped to Toronto. For his part, La Russa recently told the Post-Dispatch that he feels good as he nears his 67th birthday, and the expectation in St. Louis is that both sides will likely honor the manager’s mutual option for 2012. 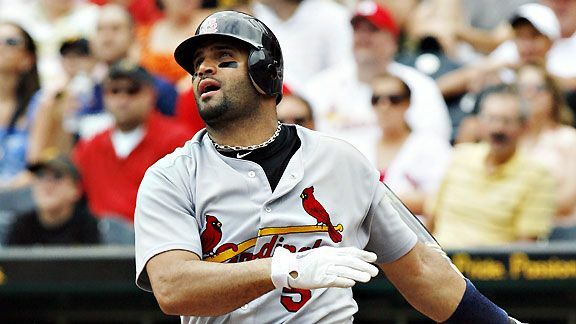 That could push Pujols closer to re-signing with the Cardinals and the only major league manager he’s ever known. But given all the question marks in play, Pujols’ landing somewhere else might not be the end of the world. It might even work to their advantage. All stats have been updated to reflect September 1 games. That same year, Barry Bonds swung at a microscopic 8.8 percent of pitches outside the strike zone. Think about that. Bonds led the league with a .538 wOBA that year, in one of the most potent offensive seasons in baseball history. He almost never got a pitch to hit. But rather than hacking at a pitch out of the zone and rolling a grounder to second, he waited for that one pitch he could hammer. Bonds walked 232 times in 2004 (120 intentional, many more semi-intentional) and struck out just 41 times. I know, I know, Bonds’ legacy is tainted in everyone’s eyes, and even today we still jump to conclusions whenever a player sees a sudden spike in power. But just for fun, go look at Bonds’ 2001 through 2004 seasons. By all means, lament Bonds’ career path if you like. But there’s an excellent chance we’ll never see anything like those four seasons again in our lifetime. That’s sad. As always, when we say “bad luck,” that’s shorthand for “factors beyond a player’s control.” If you don’t believe in luck or destiny or kismet, call it “random variance.” Or “holy crap, every defense was playing out of its mind when they faced Albert Pujols.” Just know that a hitter doesn’t have much control over a ball once it leaves his bat, just as a pitcher doesn’t have much control over a ball once it leaves his hand. Carl Crawford is a rare exception. He’s not exactly helping the case for speed guys. Other players who’ve suffered La Russa’s wrath include Fernando Tatis, J.D. Drew, Scott Rolen, and Brendan Ryan. The Cardinals have seen mixed results in ditching those players. La Russa was concerned about Tatis’ work ethic and body type, which led St. Louis to trade a power-hitting third baseman in his mid-20s. Sure enough, Tatis was a disaster for the Expos and was out of baseball a few years later. Drew went on to many productive years with other clubs, but the Cardinals could hardly complain after getting Adam Wainwright and more for him in the trade. Rolen went on to put up some strong seasons elsewhere, including with the rival Reds. Ryan hasn’t hit much for Seattle, but he’s given the M’s a great glove at short that St. Louis could really use.